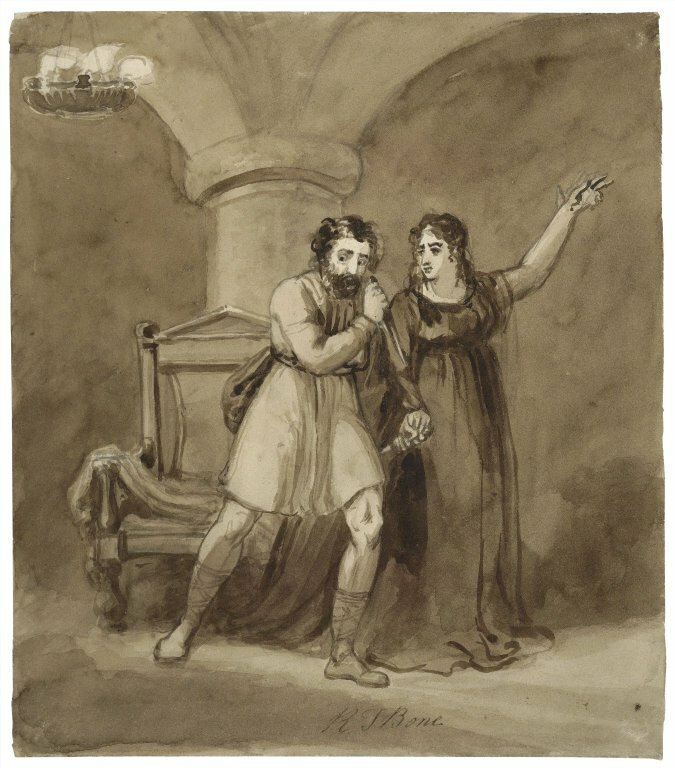 Macbeth and Lady Macbeth, after the murder of Duncan. R. T. Bone. Courtesy of Folger Shakespeare Library. The large dented cauldrons of spicy green curry, red curry and duck soup were cloaked in hovering fog and steamy air of the monsoon season. It was evening at the Gate Market in the heart of the old city of Chiang Mai, in Northern Thailand. As I slurped a bowl of noodles so spicy it induced tears, all I could think about was Macbeth. Three days fresh from college graduation, I had boarded a plane bound for a one-year teaching fellowship at the prestigious Chiang Mai University. Growing up, my favorite musical was Rodger’s and Hammerstein’s The King and I, the story of Anna, hired by the King of Thailand to tutor the royal children. I was forever singing the lyrics to Getting to Know You, beginning with Anna’s declaration that “When you become a teacher, by your students you’ll be taught.” Now, heading to classes as a young teacher, I could not help but think of Anna. By day I guided a hundred and fifty university students in my elementary-level English classes through the intricacies of usage between “say” and “tell”. But, I wanted something more: I wanted to teach theater. So, I approached my colleagues in the English Department with an ambitious plan. The students in the university’s English Club staged an annual play in English – Cinderella last year. Hesitantly, I proposed to direct Macbeth – my favorite Shakespeare ever since I played the First Witch and Macduff’s doomed son in a 7th grade production. The department was dubious – the language would be too difficult. I persisted. Auditions were set. But our real challenge was not the play’s language, but its content. In one of the last countries with a revered king, I was preparing to stage a regicide. While monarchies worldwide have become nearly obsolete, the Kingdom of Thailand’s ruling line remains robust. King Bhumibol Adulyadej, or Rama IX, has sat on the throne longer than any other current ruler. He is the great-great-great grandson of the famed monarch who had hired Anna. Arriving in Chiang Mai, I discovered that The King and I was banned. The king is endowed with near-divine status, and is protected from slander by strict lese majeste laws: Anna’s irreverence to the king crossed the line. Adapting Macbeth would not be as simple as robing Shakespeare’s characters in traditional Lanna-style sarongs. I found that Thai students were reluctant to engage in open political discourse. In college classes in the U.S., I had been inspired by the boundary-defying nature of theater. I wanted to draw my students into political discussion, to have them think critically about the parallels and differences between East and West. Yet it was crucial we remain respectful of the monarchy and of Thai cultural traditions. We began adapting Shakespeare. Macbeth, the Thane of Cawdor, and the other thanes would be Thai politicians. The ghostly apparitions would be conjured through Thai shadow puppetry. The witches became street children, who sell jasmine garlands at night across Chiang Mai. We erred on the side of caution. We nixed the colors red and yellow, being too closely associated to the two rival political parties, and opted for a neutral orange. We modified the traditional Thai sword on our poster, because it resembled the weapons favored by the monarchy. When I suggested that the play end with Macduff placing a foot on the severed head of the Scottish tyrant, the actor, an otherwise modern and outspoken junior, refused. In Thailand the head is the most sacred part of the body. The feet are the lowliest. I dropped the idea quickly. The following Monday, I met with my freshman English class who I had assigned to see the show. I asked them to identify the Thai elements in the production – expecting such responses as: the attire, the puppetry, the traditional Thai greetings. Confused, I pressed her to explain. “He’s describing the teachings of the Buddha.” Macbeth had finally realized the insignificance of his vaulting ambition – a first step toward enlightenment in Buddhism. I was dumbfounded. I had read Macbeth, studied Macbeth and acted in Macbeth – never once had I drawn the parallel. Miss Anna had gotten it right. I had set out to teach my students Shakespeare. But, in the end, by my students I was taught.